2 Step, Access History, and Authorized Applications went out with last night's service update, works on all the clients, and is available to Premium and Business users (with eventual Free user rollout). You've been able to see access history for a while, and is available to all users. I'm disappointed that free accounts are not getting this basic security feature immediately as well. 'Eventual free user rollout' doesn't seem like it's coming very soon. True. It would have been nice if they could do it all at once, but I think a gradual phasing in of the feature starting with a few thousand people is a lot better than throwing it out to 40 million people, because any hiccups are much less disruptive this way. Obviously, you could upgrade to Premium for a few months if you want to take advantage of the feature! This is (in my memory) one of the few times when Evernote has explicitly said a feature is headed for Free when they introduce it, so I think it is good to see the commitment there. Appreciate the reply GM. I would have not posted if a rollout schedule had been posted instead of the nebulous 'eventual' answer. As for paying for this feature I don't see it as premium (unlike encrypted notebooks) since most everyone is providing 2fa functionality now. Good points. I wouldn't be surprised if they float a date (as they did with 2fa), so it doesn't hurt to ask for a general timeline. However, they might not be able to give it, because this is a kind of test phase, and they want to see how it goes. Assuming all goes well, it might be quite soon. Btw, the only "bug" we're seeing related to Two Step at the moment is where a button during setup, usually the last "Complete Setup" button, stops working. This is because the security area of your settings actually has a timer set for it (should be 10 minutes), and if that timer runs out during set up, you'll need to restart the process. I *believe* the timer starts at initial login to your entire settings area, so if you haven't been prompted for your password at the security area, you're sitting on that timer and may run into an unresponsive button. Awesome step, but I would rather have support for Google Authenticator. Would be awesomer. It actually does support Google Authenticator. Works great. You need to set it up with SMS first, but afterwards you can hit the Settings button and switch it over to Google Authenticator. I can't seem to set this up. I go to the security page where I have three choices of things to do. The last of which is to set up Two Step. The word "Enable" is in blue but unlike the other two choices, it does not operate like a link, no little hand or underline appears when I mouse over it. However, I can right click it. When I click on it, I am taken to this generic page: https://www.evernote.com/SecuritySettings.action. The other two options result in pop ups. I am a premium user, on Windows Vista. I've seen this behavior and am checking into it, but the link should still work, even if the mouse over isn't registering it. Can you left click the link regardless of it not reacting to your mouse over? I can't get past Step 1. The SMS doesn't arrive. Tried three times, full signal on my phone. I'm on Orange in UK. I tried 2 times from germany (E-Plus) to get the initial SMS. But both SMS has not arrived until now (1/2 hour later). Now (45 Minutes later) 4 SMS arrived, all with different codes. and mine JUST arrived nearly two hours later! I want 2-step verification for Evernote only, but not for Google. Can I need the Google Authenticator only for Evernote or is this only an addition to an already existing 2-step-auth. with Google? EDIT: Yes, it is possible to use it with Evernote only. Is it OK for Evernote when I login 5 times a day to this forum and every time Evernote has to send me a SMS? (I think of the costs of SMS). I'm seeing some problems with this, the SMS message can take too long to arrive and often, maybe as a result of the delay, is not accepted. The forum and web logins have a tick-box to allow me to be remembered for 1 week, how does this work with the 30-day memory at the verification stage? It seems I'm barely remembered for more than a few hours on the forum anyway. Sorry, it took me some time to get back to you, but I did some real life. I checked again this morning and it is still doing the same thing. Yes, it does act as a link if I click on it, but it takes me to that generic page I put the link of in my post. As far as I can tell there is nothing to do on that page. Edited to add: I realized after hitting post that the generic screen I was seeing was the same url as the real security page I had started on. Let me post a picture of what the generic screen looks like. Finally!!!! Way to go Evernote! THANK YOU FOR ENABLING 2-STEP AUTHENTICATION! Thank you also for enabling it with a phone number, backup phone number, backup codes and use of Google Authenticator. For those who are upset that the free versions do not have this, come on board the Premium wagon. $45 is affordable to all!!! Now, oh dear Evernote, let's get to the subject of better encryption of our data on your servers - in a manner similar to that utilized by DropBox. However, right now, I am thanking you for what we have received! 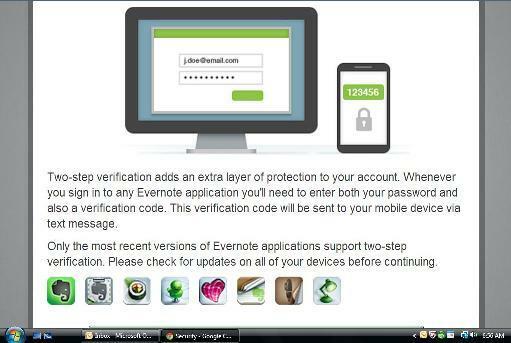 As of this morning, I have been heling friends and relatives activate 2-step authentication on their Evernote accounts. There is no tie into your Google Account(s) at all. The Authenticator has Google in the name because they wrote it. You can add and remove whatever sites to the Authenticator you want, that support it. For example it's trivial to add Google Authenticator support to your own WordPress blog. And LastPass has Google Authenticator support. There is no interaction with Google servers at all. As for SMS, I would think EN has built the costs into their business model if they rolled out that as the default. But you could switch to the Google Authenticator if you want to be thrifty. The side benefit there is that it doesn't have to be a phone even. It could be an ipod/ipad type device without a data connection. It not as secure but you can even put it on a backup or spouses device as well (accomplished by having both Google Authenticators present and scan the QRCode image at the same time during setup). In a sense it breaks my usual IT tenant of 1:1 tie-ing of credentials to people, but essentially my wife and I are one. Thank you cwb. In the meantime I have read up on the google authenticator and that the key-generation is independent from google. Now I am already using it and it works very well. No SMS needed any more. Only for backup. Thanks for adding this important feature. Ever since enabling this for my account I can no longer sign in to the Safari extension. I was expecting it to prompt me for the security code after entering my username and password, but it just says "invalid password". The web clipper and chrome extension seem to work properly and prompt me for the security code. Am I missing something or will the Safari extension need an update? The current version (Build ID: 78f7d0f see "options") works fine, but perhaps your installed version needs an update. Point being, both old and new clients can work with 2 factor, nothing's left out in the cold. But it's certainly better to use the latest 2 factor aware versions. Thanks for the reply. I had version 5.9.12 which I was updated to by using the built-in Safari mechanism for updating extensions. Doing that I assumed that I had the latest version, but 5.9.15 was the version available on the Evernote website. Updating to 5.9.15 resolved the issue and now 2 factor auth works as expected. I've just noticed that the two-factor-authentification doesn't work with the mobile page http://www.evernote.com/mobile/Login.action. When I enter my user name and password, I have access to my account without entering a two-factor code but I can't see any notes. Therefore, it's not a security problem as one accessing this page can't see my notes. But it's indeed an error because you can't use the mobile page any more. Is this for US-based Premium users? I'm in the UK, and a premium user, but for all I keep hearing about it, I don't have it. It's definitely available in the UK. Is there not an option to turn on Two Step in your Evernote Web security settings? >> It's definitely available in the UK. Is there not an option to turn on Two Step in your Evernote Web security settings? That is so interesting: I realise now that I simply never go to evernote.com. Never. I use the Mac, iPhone and iPad apps and I just never even think to find a reason to go to the website version. But I have now and you're right, there it is. Great, thank you so much. Do you know, I swear I watched an Evernote video about two-step authentication and still I didn't learn that it was on the site version? I'll go set it up this moment. I found the SMS feature a bit unreliable. Try the Google Authenticator app instead, it's much more convenient, for a start it doesn't matter if you've got no mobile connection. The authenticator does work well. Just an FYI, there are a few other free and paid OTP apps which are interoperable. Aesthetics aside, one thing I liked was the ability to add a pin, so that it's use is restricted. Thank you for the recommendation. This app does work with Evernote. I'm relieved to have secure access to Evernote again with TFA. Had same issue in Google Chrome 30.0.1599.69. Tried 3 times, didn't try to right click. Worked just fine in Safari, though. A question: what happens when I change my phone number? I tried to setup the two step verification. When I input at "Enter your mobile phone number", it was rejected with message as "Enter a valid phone number that can receive SMS messages" and the setup was incomplete. I'm from Indonesia and using Indosat phone with SMS capable. Shall the process work at any country/operator ? I would definitely recommend resetting this prior to your phone number change, or using an app like Google Authenticator, which is independent of your phone number. Additionally, we do provide the reset codes that should be generated and stored somewhere safely. I would like to be able to use more than one device with the Google Authenticator (Android phone, iPod Touch). Apparently this is not possible... If it is please show me how! Sure you can. When the QR code is presented program it into multiple authenticators. I saved the setup QR code into an encrypted note in lastpass. So Ican setup a new authentication device if/as needed. This would generally be less secure except that I have Lastpass geographically restricted and second factor secured with a Yubikey. It's not supposed to be... It exposes the weak link of software second factor. It can be cloned (at least at setup). So yes, a little pre-knowledge and effort is required because you're slipping off the designed path. It goes against the tenants of secure authentication to have duplicated authenticators. So you got it in 1. It's not supposed to be user friendly to do. I'm having issues setting two-step authnetication up in the first place. I get my verification email just fine, but after inputting my phone number, I never get the text message with the confirmation code. I've confirmed numerous times that the number and country code in the dropdown menu are correct. I've even tried two browsers, Chrome and Firefox. Something wrong on Evernote's end? Edit: Tried using Opera 12.16 and it finally worked. I tried to enable 2-step authentication today. First try, I finished all the steps on that dialog by clicking "Continue" and doing all the necessary, but still saw "2-step authentication not enabled" once back to the Settings. Second try, it worked. Second try was done immediately after the first try. So now the issue is, I always got two verification code in Google Authenticator. Could anybody from Evernote take a look at my account and fix it? I am assuming there is some "shadow" associated with my account during the 2-step authentication phase. I'll file a bug and get back to you. Bugs been filed and we're checking out. Since you've successfully enabled Two Step, you just need to delete one of them (the one that does not work) from your Authenticator application. D'oh! I've spent nearly an hour hunched over my desktop and my laptop, trying to figure out why none of the SMS' sent to me have worked; I get "The code you entered is not valid." I finally figured out what was going on; I had added Evernote to my Google Authenticator, and apparently that invalidates any of the codes I receive from SMS. - If signing in with SMS-sent codes is disabled by design when the user has turned on gAuth, then codes should no longer be sent to that user via SMS! Some clarification--the option to activate Authenticator or SMS is either one or the other. Are you activating an auth account outside of your Evernote security settings? Next - extra access control to individual notes/notebooks ? it's a long thread.. basically i just want to know if SMS authentication doesn't work (only with Evernote; it works with LastPass) how else can i enable two-factor authentication using Google Authenticator? That's a little brief, no? They both work. When I used it, SMS wasn't as reliable. Sometimes on Evernote's side, other times I know SMS is subject to delays from my carrier. All in all, it seems like a lame system compared to the alternatives. Google Authenticator mode works great with Evernote, so that's what I use. Actually the protocol, I left Google's actual authenticator app for one of the many better alternatives - HDE OTP in my case. Just turn it on in your Evernote account settings. You're walked through setup. I hope someone can assist me. I used to have google authenticaiton working on my iphone. I got a new iphone, reinstalled all apps (setup phone as new). I loaded authy and google authenticatior. I snapped the QR code in both. And both show the exact same token number. "Your code doesn't match what we're expecting." Does anyone eles have this problem? You're going to need to use one of your back up codes in this case. Google auth and other authenticator services are going to generate locally for your initial set up, and that set up only. The error you're running into is because it's expecting to authenticate using the original token set up, and not the new auth tokens you're now attempting to use. This is expected behavior for two factor--similar to what you would see with an SMS text message to a single device. Your code doesn't match what we're expecting. Ugh. I just discovered why the Evernote clipper bookmarklet stopped working on my iPad: it's because of two-step verification. Turning two-step on makes the bookmarklet appear to function (kind of), but the clip never makes it to Evernote. With two-step enabled, the bookmarklet does ask for the Evernote password, as before. It's dialog does display, but there are no choices in the Notebook pull-down menu. I realize that Evernote doesn't formally support this bookmarklet, but is there anything you can do at your end to make this work without forcing me to forego two-step verification? I use the two step verification and it works well for me. Hey aussiebob, I had difficulties trying the bookmark address that you posted, but that's not surprising as it went through several layers of URL encoding and decoding on this forum site. Nevertheless, your post did encourage me to re-enable two-way verification in my Evernote account settings. Wonder upon wonders, my old clipper bookmarklet began working once again as it always had before! My guess my timing was bad the first time I enabled two-way verification. Perhaps I hit a "bad spot" at the Evernote server end when I did this before, and that left me unbookmarklet-able. Whatever – I can clip once again from Safari on the iPad, so I'm really happy! Obviously, I very much appreciate your post! Thank you! I've been trying to set up two step authentication (Android) and i can get as far as Enter a Backup Code, but when I hit Complete Setup, nothing happens - the Enter Backup Code window continues to display with the Security Summary Page in the background. If i hit Complete Setup again, I get another pop-up saying "the following pages have become unresponsive" (it lists Security Summary and untitled, which I assume is the Enter Backup Code window) and it gives me the option to Wait or Kill the pages. I've waited up to 30 minutes, but still nothing. Tried several times with no luck. I saw this after I posted my issue with completing the setup with two step authentication. It sounded exactly like the symptom I was having so I tried the setup again and timed myself. It took me about 5 minutes to get to the Complete Setup button, but still the same thing - no response after hitting the button. Any other suggestions? PROBLEM SOLVED! Switched to IE (was using Chrome) and was able to complete the setup. It pays to persevere. This is genius. I was wondering how to manage multiple/new iOS devices that need google authenticator set up on them. What prompted it was getting a new iPad and realizing that I could not regenerate the QR code necessary to make it work with Evernote. I saved the code image as well, keeping it in an encrypted location. Two-step authentication seems to break compatibility with my Sony PRS-T2 ebook reader. The device includes a built in Evernote client which worked fine. It's used for synchronizing data and to save links or text snippets. Now I was trying to access Evernote for sending a link from within an ebook. I got a "account not setup" message. When I was trying to setup my account, I always get an "user name or password invalid" error. My login data is correct, I just verified with it the web interface. So what's going on here? Does two-step authentication breaks old apps? From this thread I got the conclusion that old apps should still work. Is there any workaround available? It will break them if the app is not update to handle Evernote 2 factor security. Evernote generally gives 3rd party developers plenty of notice of changes ahead of time. It's up to the app developer to update their application to account for the change(s). Have you placed a support request with Sony? So it seems that I have either to accept that Evernote sync is broken or to switch off two-factor authentication. Sony will not update their built in app and there's no Evernote app for Android 2.3 available. Hm, I'm not sure what to do now. Since then, in their INFINITE WISDOM, Evernote has taken it upon themselves to modify their web site to detect that you're trying to connect from an iPad or iPhone and HELPFULLY inform you that they don't support using Evernote from these devices. So, it won't let you log in. So, you can't go through the second authentication factor. So, you can't get your new cookies. So, you can't get the Evernote clipper bookmarket to resume functioning. WE DON'T NEED YOU TO PROVIDE US WITH ANYTHING NEW HERE, EVERNOTE, WE JUST NEED YOU TO STOP BEING SO MYOPIC AND STAY OUT OF THE WAY. What os and browser are you using? What are the steps that you followed to enable 2 factor authentication? 2 factor authentication works so smoothly for me, it's hard for me to imagine people are having problems with it. But maybe I can give you some ideas to try to get it working . It works after upgraded to latest version. I guess I was using a very old version. Really glad that Evernote has two-factor. I only recently discovered this so I am late to the game. But one question: It only allows identifying a computer for 30 days, implying I have to every 30 days re-enter an authentication code. This seems odd to me. If I am going to authorize a particular computer at all it seems I would either say don't remember the computer at all (such as using a public computer) or say that I want to remember it always (using my own computer). All other sites I use that rely upon two-factor have this binary decision with a single check mark to remember the computer or not. What would be the purpose for only remembering an owned computer for 30 days? What would be the purpose of remembering a public computer for as much as 30 days? I'm sure I'm missing other aspects of how this might be helpful but it is definitely not helpful in my case -- and is even annoying. I want to be able to say "remember this computer" and be done with it because I use it all the time. Or, I want to not remember it at all, and have to always enter the authentication code so I can be sure I'm not inadvertently leaving it mistakenly accessible for some while after I am no longer using the computer. At minimum, please add an option in addition to the 30-day option to remember a computer indefinitely. I have two step authentication working well, but just ran into a head scratcher... I had the authenticator setup on my phone and just replaced it with a new phone, how do I setup a new device? I found the genius idea of saving the QR code for future devices in an encrypted location... Wish I'd thought of that. Given that I didn't, how do I enable other devices? I had trouble posting my reply. The all-wise forum software supposes that my message, which includes no attachment and no URLs, is suspected of containing spam. Really, this is too much. How could anyone present unwelcome commercial e-mail without any attachment or even one link to click? And what am I supposed to do in order that my message might look less like suspected spam? After my troubles with TFA my respect for Evernote is waning today. . . .
Good! And it's not difficult to setup QR code. How can I use two step auth, and not asking auth overtime clip to Evernote. That won't help. I use 2-factor authentication, and it's been asking me to log in (with my password though not demanding 2FA) each time. I know this is an old post but I just setup Evernote on my Sony PRS-T3 Reader. Click "Generate New Application Password"
Make a note of that password!